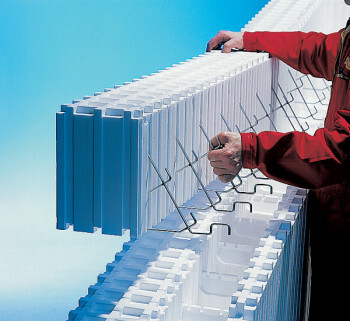 BecoWallform components have tongues on the top and grooves on the bottom, arranged so that they will interlock in parallel or at right angles in a modular grid of 62.5mm. This means the designer can realise any plan layout to dimensions which are a multiple of 62.5mm. 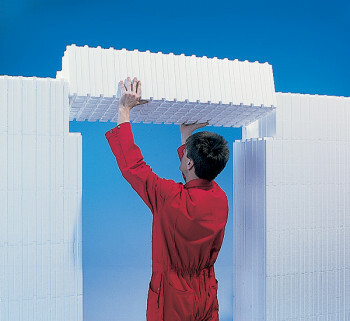 Smaller site dimensions may be cut exactly to size within the thickness of polystyrene once the concrete is cured. 1. 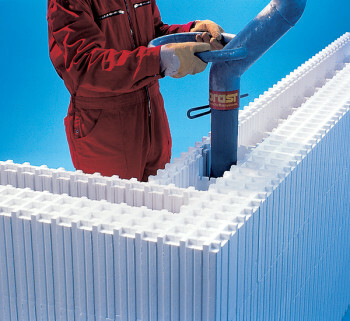 The lightweight Wallform elements simply fit together in a modular grid of 62.5mm. 2. 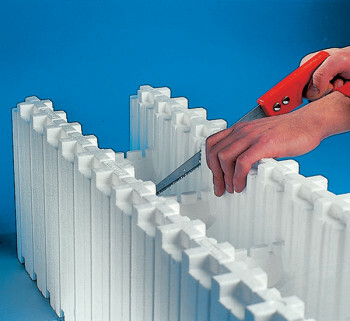 With a saw or hot wire cutter, components are easily cut to size. 3. Openings at wall ends, corners and T-junctions are closed with the end pieces. 4. 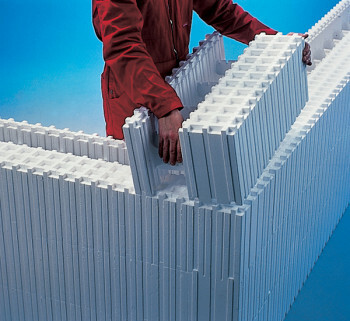 Using the Wallform corner block, 45° corners fit together without thermal bridging. 5. 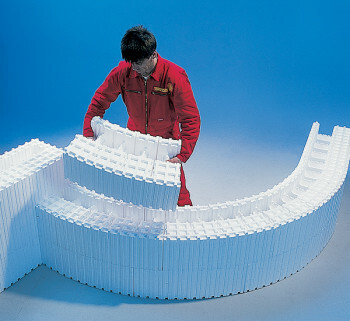 Curved walls in any radius and in any thickness are possible with Wallform curved blocks. 6. 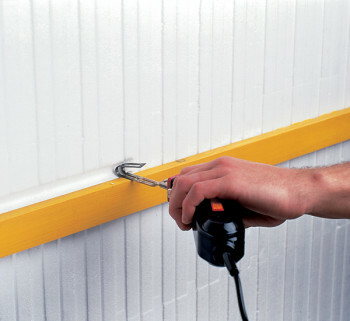 The Wallform lintel or roller shutters are placed over window or door openings. 7. 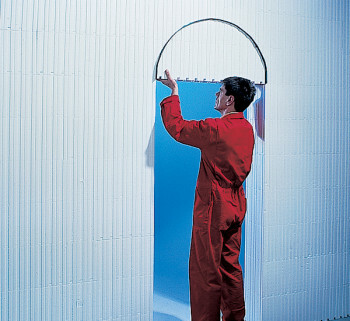 Arches are formed by cutting the opening shapes and inserting a metal sheet to act as a curved shutter. 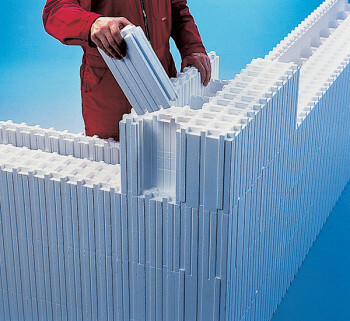 8.Wallform floor edges blocks accommodate practically all types of solid floor and prevents thermal bridging. 9. 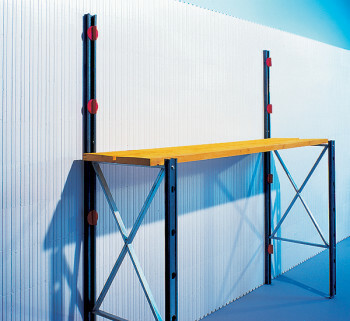 With the Wallform prop and screw support system, the wall is held in the vertical position. 10. Concreting with the Wallform nozzle and ready-mix concrete or dry concrete from a silo. 11. 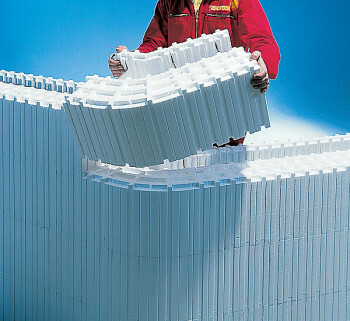 Forming service chases in minutes is possible with the Wallform hot wire cutter. 12. 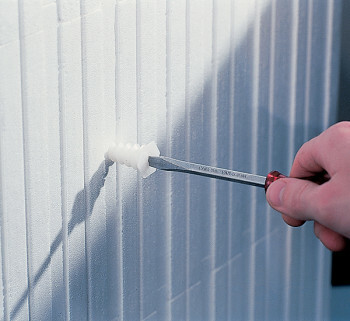 Using BTI Wallplugs, lightweight fixings plug into the insulation foam, heavyweight fixings plug into the concrete core.